Taurus is the second astrological sign in the current zodiac and is represented by the image of a bull. Although ancient Egyptians interpreted it as the goddess Hathor, the Roman interpretation stuck, and is the most common nowadays. 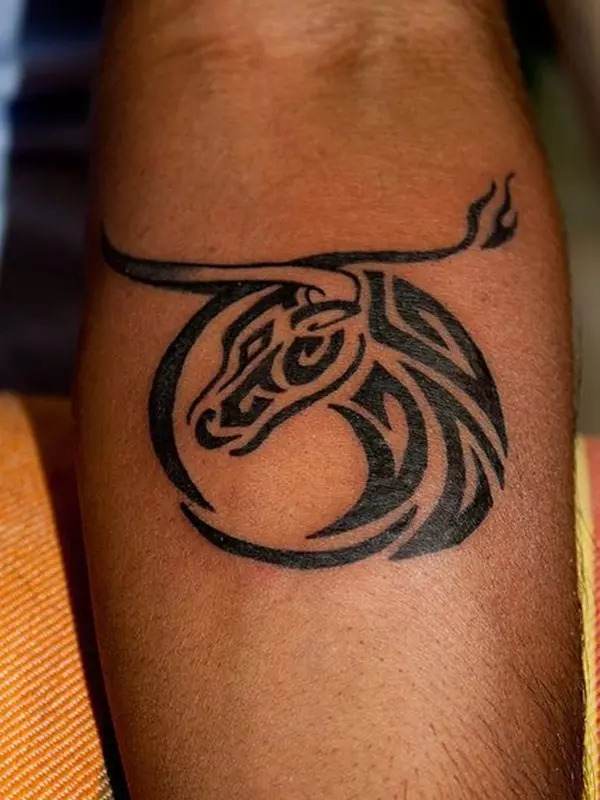 The bull is associated with the characteristics of anger and persistence, and any Taurus tattoo is used to represent these and other such characteristics: single-mindedness, strong-willed, etc. 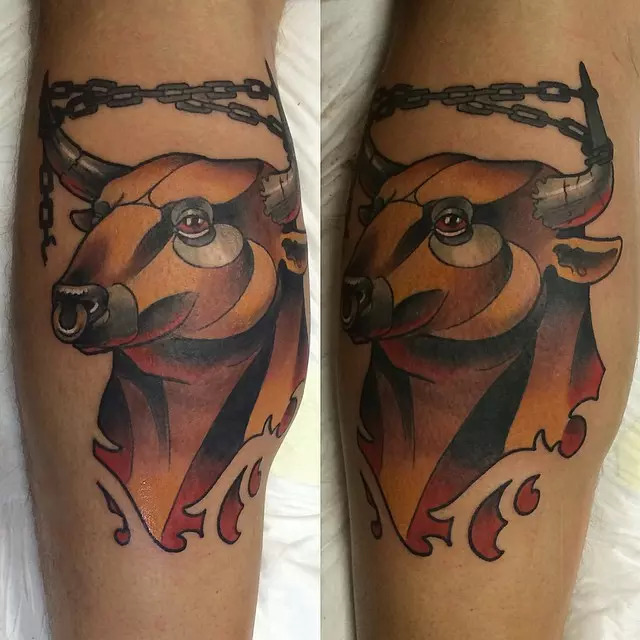 Taurus, as we all know, is represented by the bull, and whenever you wear this depiction, you’re just trying to tell that you have the same qualities as Taurus, or a bull. If you’ve ever been to a rodeo, you know the most prevalent quality of any bull, anger and aggression. It shows you are impulsive and short tempered. I know those are not positive qualities, and on the bright side, it also indicates strength, perseverance and determination, so not all bad. 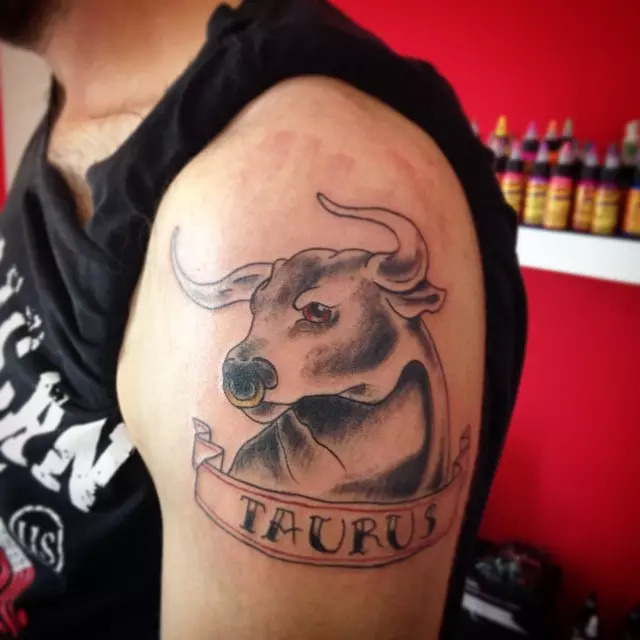 The colour of any Taurus tattoo is also very important in offering meaning. Red, for example shows passion and love, and could be used to show dedicated love to a single person. Blue is, of course, the colour of anger, which I find very fitting for Taurus. You should remember this when you get yours to avoid any confusion in meaning. I find that any tattoo placement has more to say about the person wearing the tattoo than what the actual tattoo stands for. That is to say, a bull’s head on your back and on your shoulder still stand for the same qualities associated with Taurus. 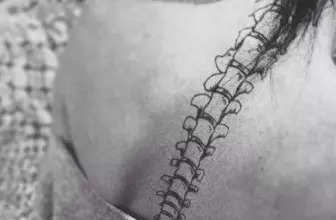 Tattoos on the shoulder and around the arm are generally kind of rebellious; once in a while you can put on a sleeveless t-shirt to show it off, but you will have it covered with a shirt or jacket. Any tattoo on the back is usually very personal and obviously meant for someone you’re intimate with; the same goes for those on the chest. 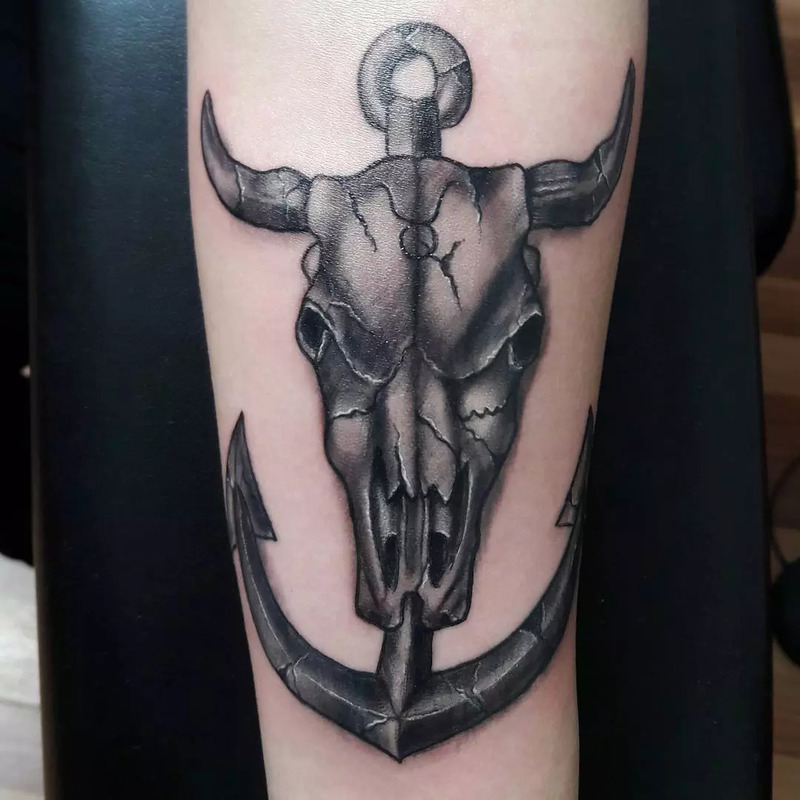 Some tattoos are also placed on the lower body, like on the thigh or foot, mostly around the ankle, these are also a bit or a rebellious indication, but most people don’t look at the legs and so, they’re good if you still want it to remain personal. 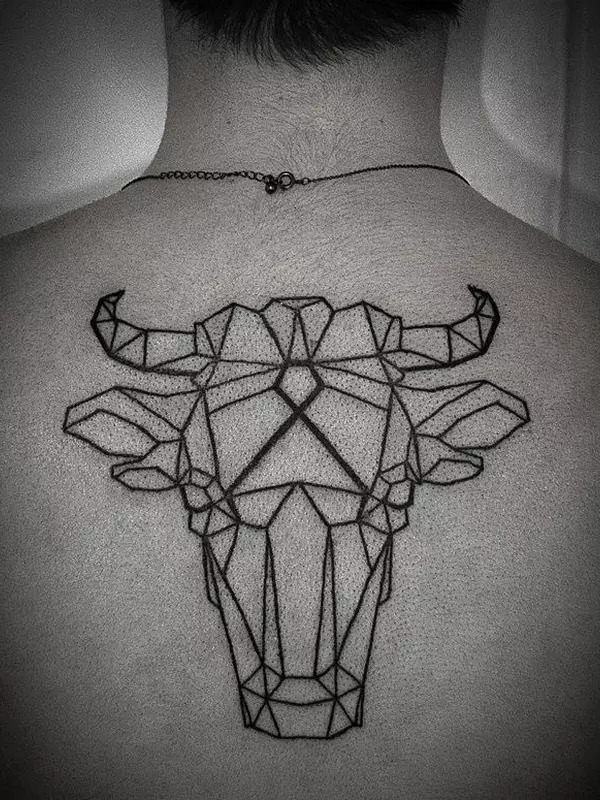 This type of design is pretty straightforward, just the head of a bull is enough to illustrate the symbol of Taurus. Still, there are numerous variations of the bull’s head, from colour, positioning, size and other additions such as words or mutations. 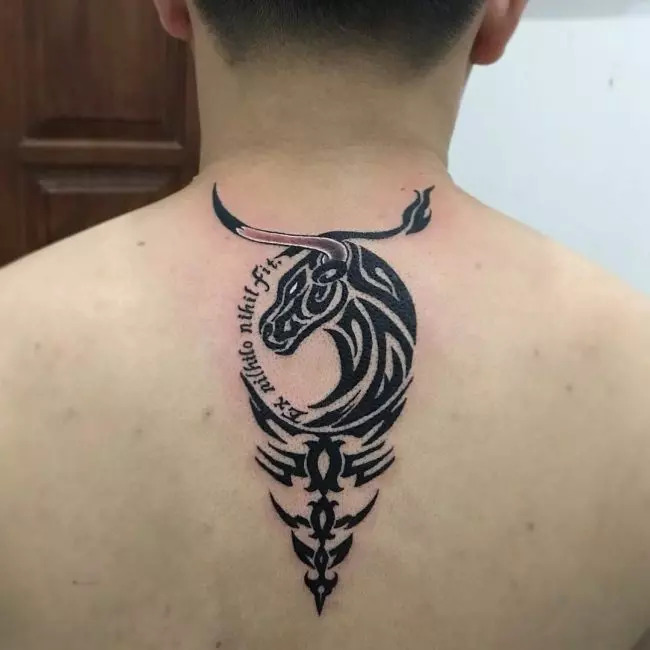 Because Taurus is a symbol of single-mindedness and stability, most of the bull’s heads you will see are black and white, although you can also go for a single dominant colour to represent a certain emotion. Apart from colour, you can choose to add some words to accompany the image; this could be the name of a person or country but most common is just the word ‘Taurus’ to emphasize the meaning of the image. 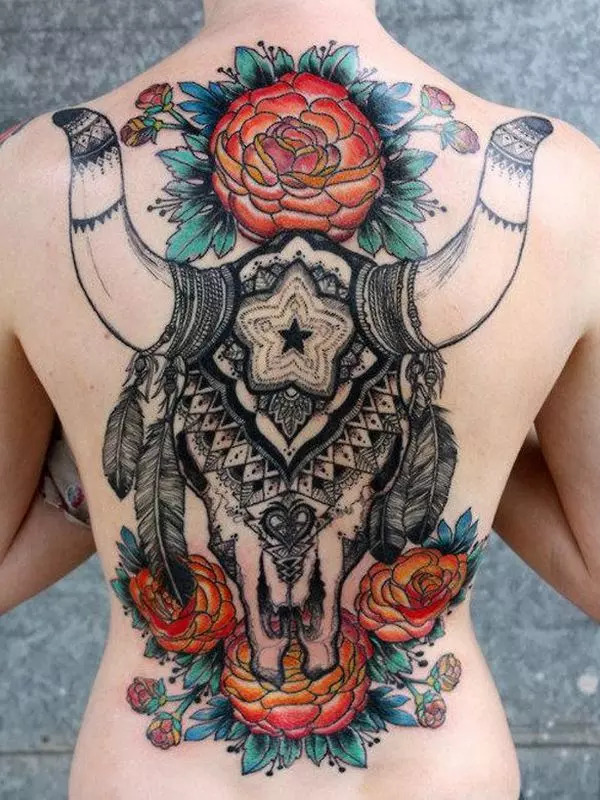 If you really want to make your Taurus tattoo stand out, adding some mutations of your own to the head will do the trick. Try adding some extra ears or changing the colour of the eyes to suit your meaning. 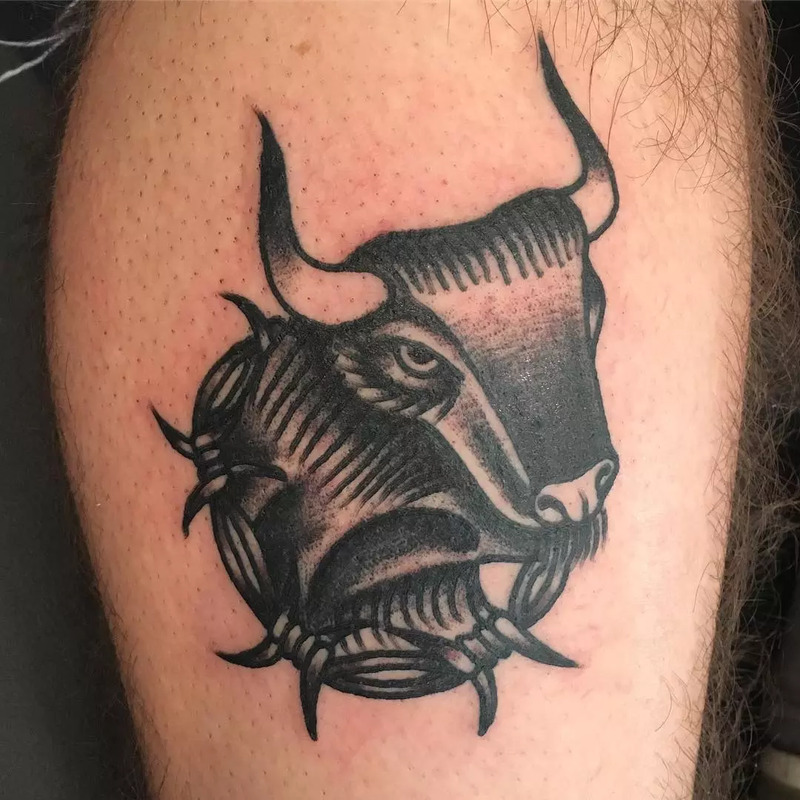 A complete image of a bull is also common in Taurus tattoos, and there are just too many variations when it comes to this. My favourite, though, is that of a muscular bull charging and puffing, literally blowing smoke out of its nostrils. This is exactly what the Taurus image stands for, aggression, but unfortunately is also the most common. The only way you can make your bull stand out is by maybe including something else, maybe one charging out from the clouds to defend a principle. Whatever you go for, just make sure your artist is good, it’s not easy to make all the features proportional and sometimes a leg may be shorter than another. If you don’t want to have to look for a correction then have a look at the outline before you begin. In mythology, the planet Taurus is ruled by the goddess Venus, so it’s only natural if the two are related. 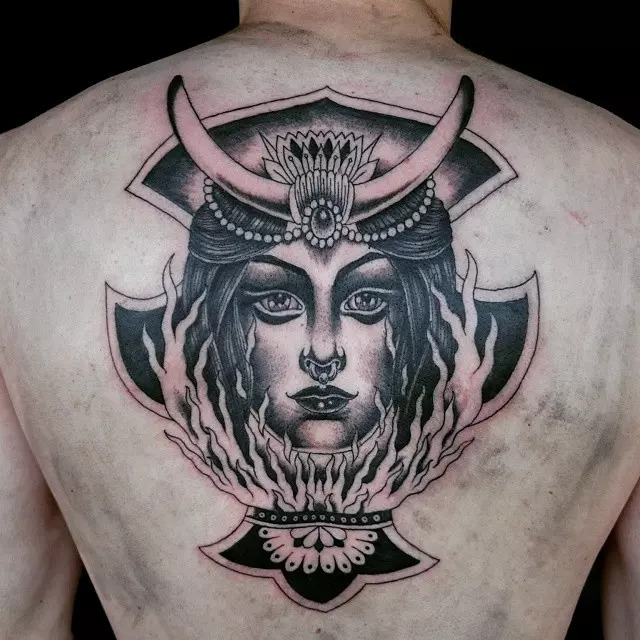 While a single image of a depiction of Venus may not qualify as a Taurus tattoo, it is more commonly seen in conjunction with a bull or just the Taurus zodiac sign. 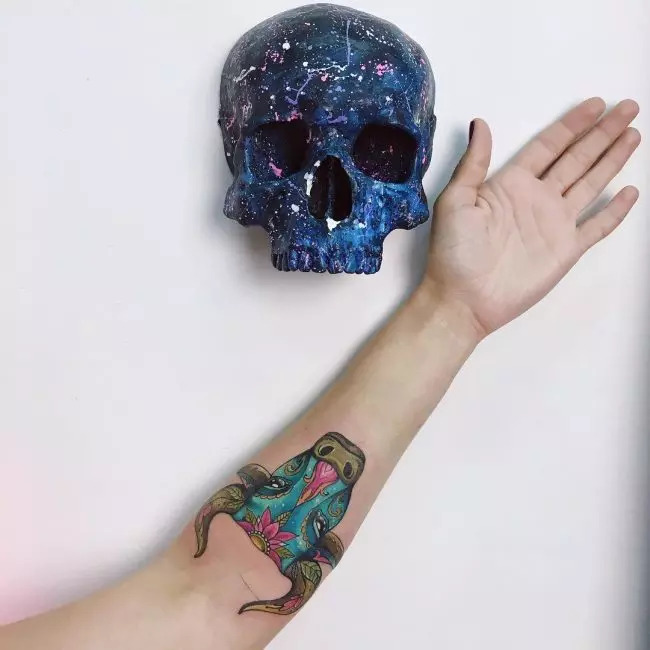 Either way, the association with Venus is a hint toward identification as a Taurus tattoo. 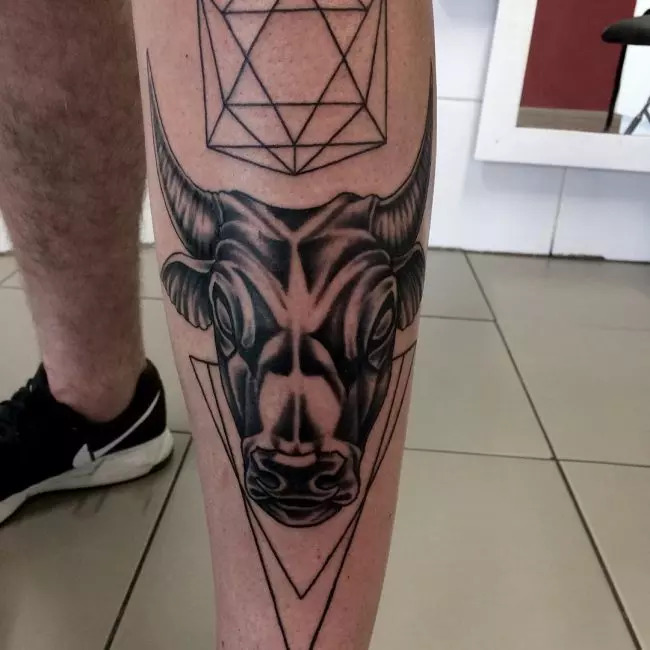 Most tribal tattoos have some kind of relation to a Taurus design. Remember most gangs and groups are all about loyalty and defending their members, sometimes using force, an attribute of the bull. As such, you don’t want to have a tattoo belonging to a certain group when you’re not a member, so you better know exactly what it stands for. 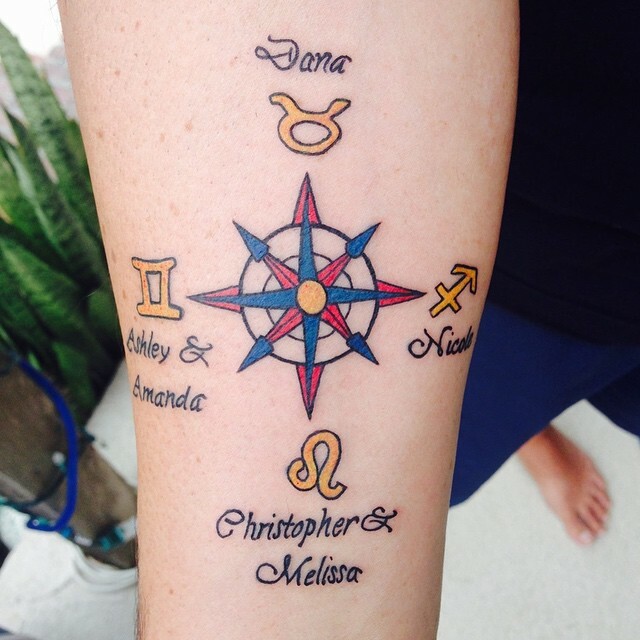 Unfortunately, I can’t list down what each tattoo means to which group, you would have to find that out for yourself. If you’re big on astronomy, then this is by far one of the simplest of the zodiac signs to produce, just a circle with a pair of arcs to represent the horns and a head. For someone who would also just like a small tattoo that won’t draw too much attention, again this is the perfect choice. The meaning doesn’t change whether it’s big or small, it’s more of a personal statement, and this has made the Taurus zodiac sign very common. 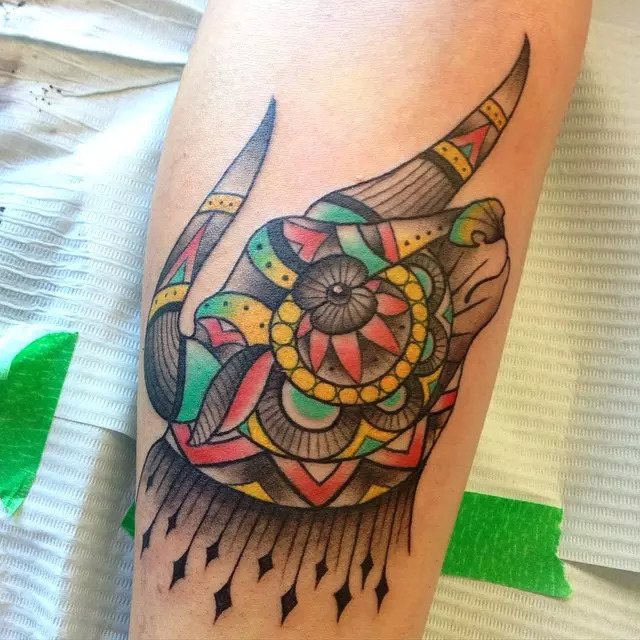 In any Taurus tattoo, the horns are the most important part, therefore, you can always just stick a pair of horns to another completely unrelated image to make it automatically a Taurus tattoo. 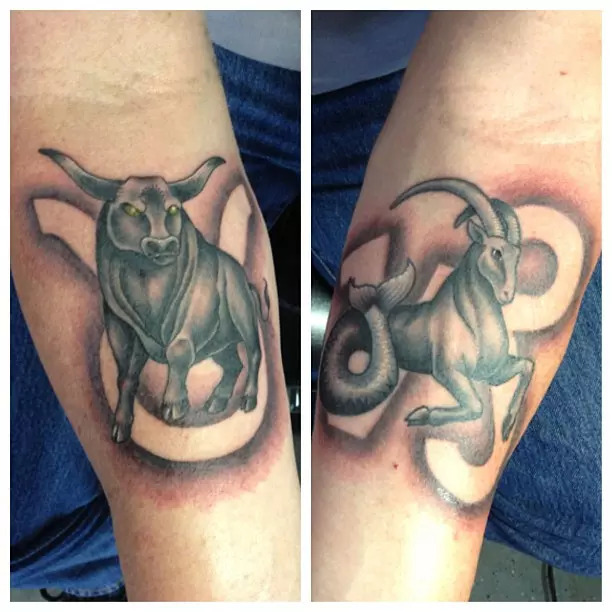 A self-portrait, for example, can have a pair of horns added to make it a Taurus tattoo. 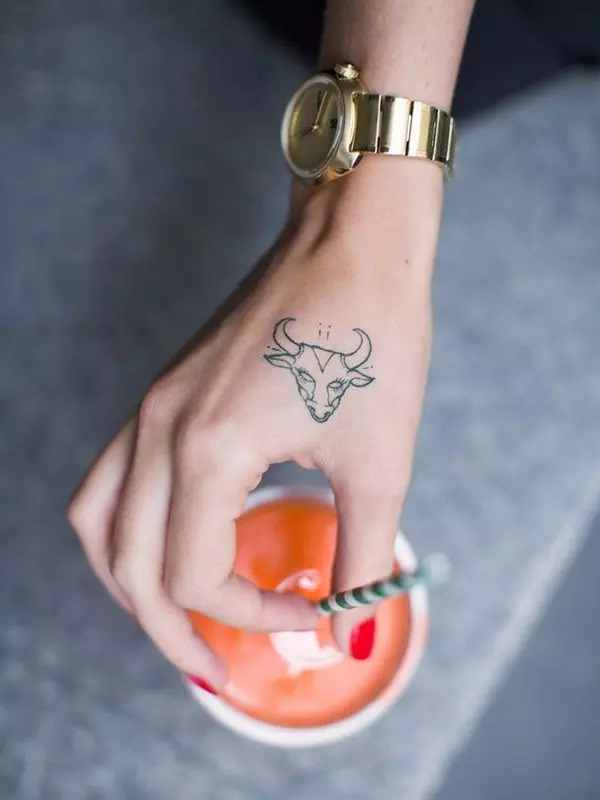 Whatever the image is that has horns added to it, that brands the depiction with all the qualities of the Taurus bull, envy, perseverance, anger, passion, etc.